In 1998, my fifteenth NFL season, my team, the Atlanta Falcons, were coined “the dirty birds”. After beating the Minnesota Vikings, my former team, in the 1998 NFC Championship, we found ourselves play the Denver Bronos in Super Bowl XXXIII. During this time, I had been Guard/Center and I handled the snapping duties. During the first half, Robie Tobeck, our starting center, got hurt. 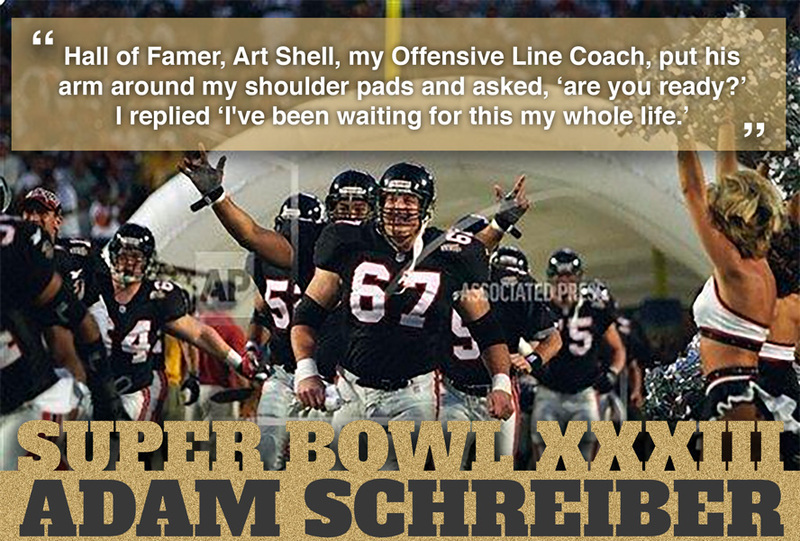 Hall of Famer, Art Shell, my Offensive Line Coach, put his arm around my shoulder pads and asked “Are you ready?” I replied, “I’ve been waiting for this my whole life.” So, I finished the rest of the game playing center and handling the snapping duties. Though we didn’t win, we played hard and the competition was as fierce as any game I have ever played in. I hope I never forget my memory of Super Bowl XXXIII.